My husband brought home three chairs with a few issues. I finished one of them. Take a look at what they looked like before. I finished the armless one first, because it was the only one that didn't sport a big hole in the back. They were all wobbly. I had to reinforce the frames. I gave this one multiple layers of white paint. 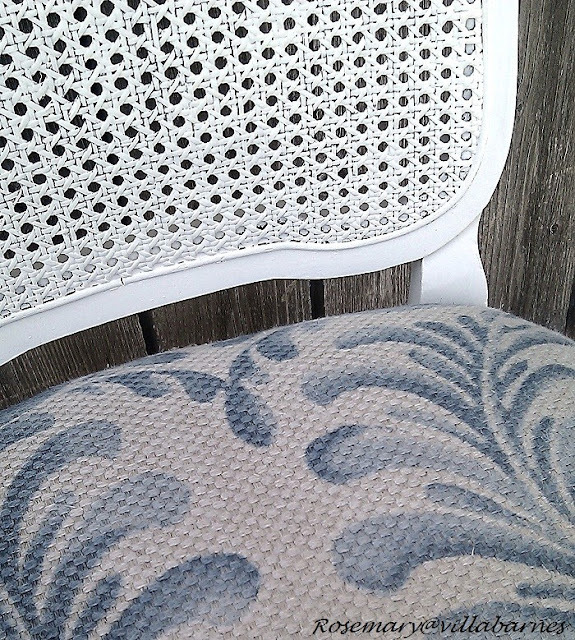 I then added more stuffing to the seat, and recovered it, using some of my recently unearthed fabric. Now, to tackle the damaged duo. See ya soon. Thanks for dropping in on my hutch. I absolutely love your chair, especially the beautiful fabric. Just a few issues...he knew you could more than handle them and YOU did. Love that fabric.Hmmm can't wait to see what you do with the other too.I am sure they will look amazing! Can't wait to see what you do with the damaged ones. I adore cane back--but always skip over the damaged ones because I don't know what to do. Love the one you finished! Wow! I can hardly believe it's the same chair! It looks gorgeous. How are you going to repair the other two? That looks great, Rosemary! I love the lines to that chair. Great that you have your husband looking for stuff for you. He's got a good eye. I'm sure you'll figure something out for the two with the holes. They were so perfectly imperfect. Your husband has a great eye for the things you can work your magic on. Love the transformation and I'm sure the others will be just as nice. Your chairs are gorgeous Rosemary! What a wonderful transformation! Wow! Now that's one amazing transformation. 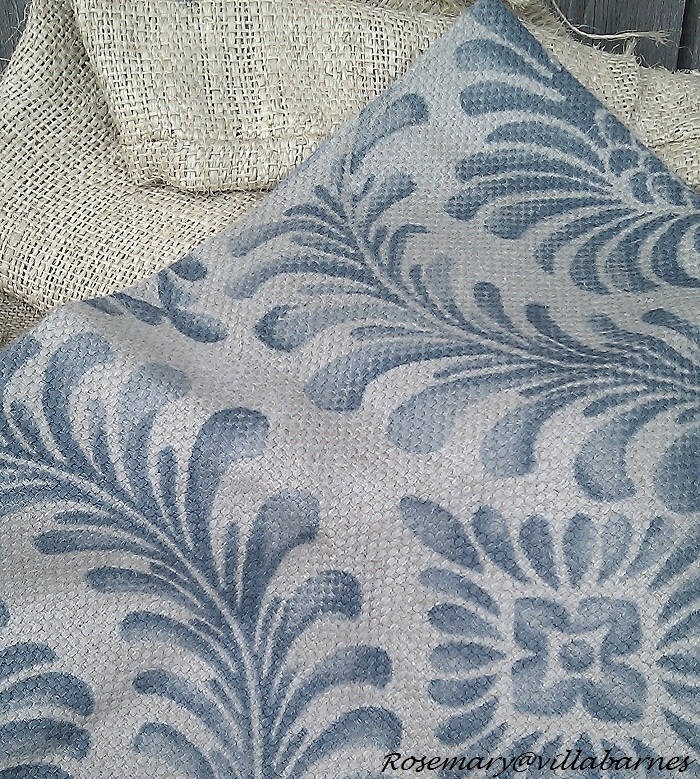 I adore the stencil type fabric you used. A hubby that hunts for good stuff. How lucky are you. Your chair looks amazing. 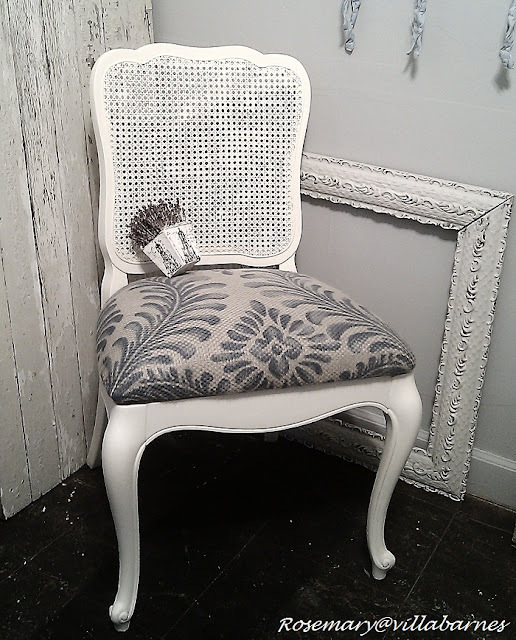 These are beautiful chairs, But you have made it even more beautiful.I love the fabric. Thanks for sharing. 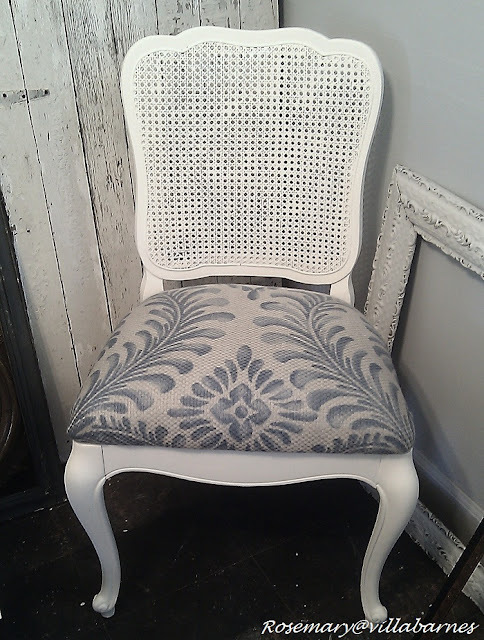 Great job on the chair and beautiful fabric! I am curious about how you will fix the backs of those other chairs? Gorgeous Rosemary!! Can't wait to see the other two! 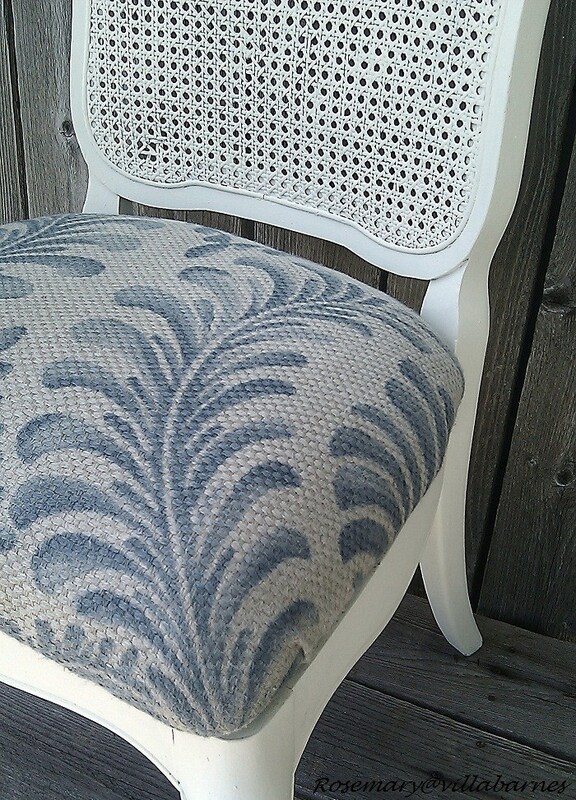 I adore that fabric and it's perfect for those chairs. Such a nice save! Can't wait to see what you do with the other 2. How lucky you are to have a husband who appreciates and feeds your need for fixer-uppers. He has a good eye, too. As usual lady everything you touch comes out positively beautiful. I had to have some similar chairs recaned, thanks to a little boy who used to build tinkertoy creations on the backs! I have thought since then they would look good upholstered, and I may try that next time. Curious to see what you do! This chair looks great. Can't wait to see the other two when you are done. I really love the fabric you used on this chair! That does look lovely, classic Rosemary style. Are you going to make them a set, or is the cane work too badly damaged? Hi Rosemary! I love that your husband has his feelers out for you too. Great looking chair! Gorgeous makeover and love that fabric. Love the transformation! You have a wonderful hubby that knew your taste and knew you could make those chair into something beautiful. Love the blue and white combo. 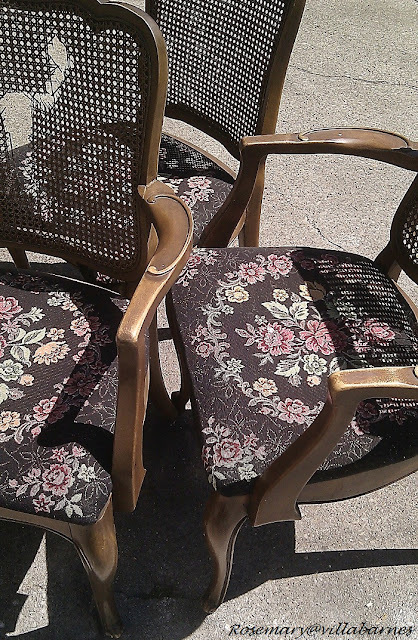 Cane back chairs are the best! Great job! Great job as always. I love that hubby is on it this as well. Its great way to have fun together. Very nice! You did a wonderful job bringing that chair back to life! Love the chair! Nice hubby! I love what you've done with this. I literally just picked up a similar style chair with a round back from a seller on CL about two hours ago. This is quite inspiring for me! That chair looks awesome...the blue pattern fabric looks great against the white. Great job! 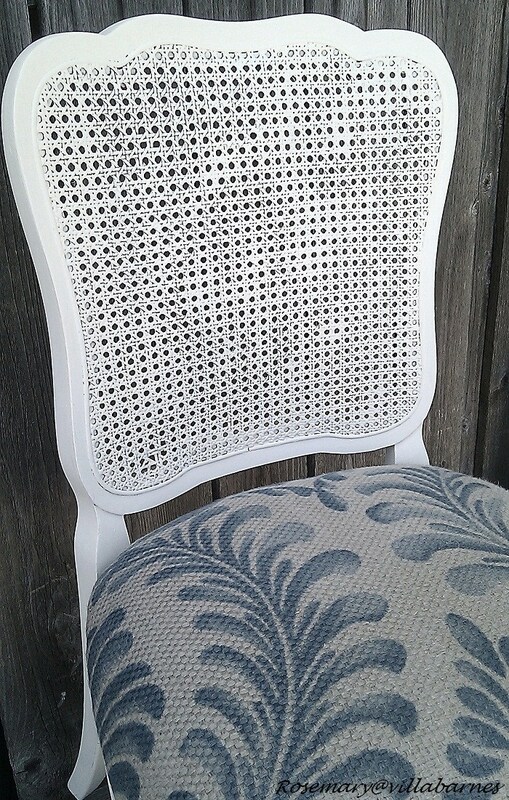 Love your redo on these chairs. They look so lovely! Beautiful job, as always! I love the added scroll on the arms of the armed chairs. Looking forward to seeing how you "fix" em. What a beautiful transformation! We would love to have it linked up at our party. You have such a good hubby. He knew those chairs were going to be amazing and they truly are. I just bought 6 caned French chairs at auction this week!! Thankfully they didn't need repairs like some of yours. You did an awesome job! This one turned out gorgeous, I'm sure you'll work your magic on the other two. Can't wait to see what you end up doing! !